Definition: SWOT Analysis is a strategic management tool that assists an enterprise in discerning their internal Strengths, and Weaknesses, and external Opportunities, and Threats, to determine its competitive position in the market. Quality in product and customer service. Obsolete facilities and outdated technology. The unit cost of a product is higher than the competitors. No or less internal control. Less quality in products and services offered. Financial condition is not very sound. Lack of major skills or competencies, and intellectual capital. Adding new products to the existing product line to increase customer base. Joint ventures, mergers and alliances to increase market coverage. A downtrend in market growth. A new entrant to the market. Substitute products that can decrease sales. Increasing the bargaining power of customers and suppliers. Changes in a demographic environment that will decrease demand for firm’s product. Logical framework of analysis: SWOT Analysis equips the management with an insightful framework for eliminating issues in a systematic manner, that can influence the condition of business, formulation of various strategies and their selection. Presents a comparative report: The analysis facilitates in presenting systematic information about the internal and external environment. This helps in making a comparison of external opportunities and threats with internal strengths and weaknesses, as well as reconciling the internal and external business environment, to help the managers in choosing the best strategy, by considering various patterns. Strategy Identification: Every organization has its strengths weakness, opportunities and threats. So, the SWOT Analysis acts as a guide to the strategist to reckon the exact position, i.e. where the business stands, so as to identify the primary objective of the strategy under consideration. 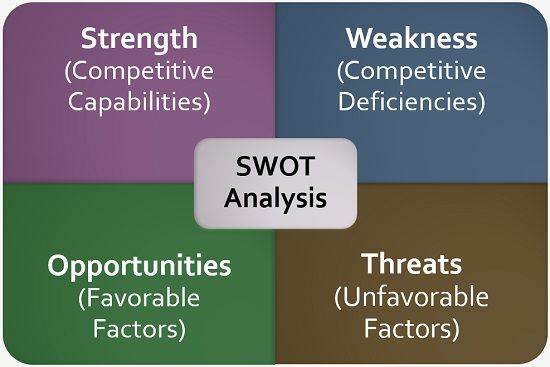 SWOT Analysis helps the company’s management in designing a business model specific to the firm. The model perfectly suits or aligns the company’s resources or competencies, as per the needs of the business environment, wherein the organization operates and helps in gaining a competitive advantage over the rivals. This will increase the profitability, market share and the chances to survive in the dynamic competitive business environment.